An illustration featuring a concealed panda among a crowd of snowmen is sweeping across social networking websites, and it’s causing people to tear their hair out. Hungarian artist Gergely Dudás posted the frustrating Christmas puzzle on his Facebook page on December 16, and it has been causing people problems ever since. This cartoon, which has been shared hundreds of thousands of times since it was published, is still winding up users who are doggedly determined to spot the panda. Although some have taken to social media to show off at having found the elusive giant panda (Ailuropoda melanoleuca), some have expressed disbelief that the panda is there at all. The human brain is designed to spot differences in patterns; these register as unusual pieces of information that need to be carefully considered. 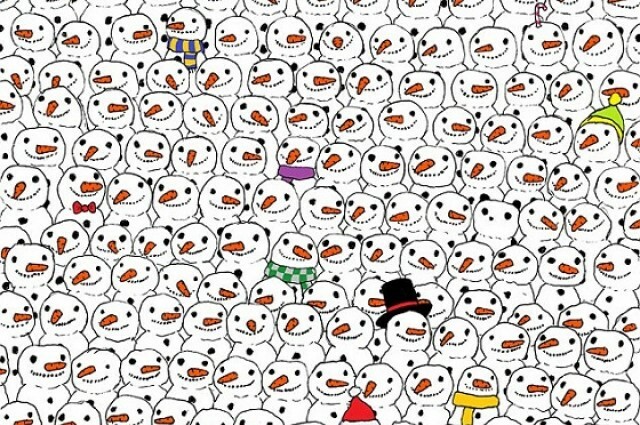 Even though a panda within a bunch of snowmen is indeed a very prominent feature, the animal in this particular environment happens to be perfectly camouflaged, so we can't immediately spot it. So have you found the sneaky panda yet?